The Hong Kong government last week doubled sales taxes on property costing more than HK$2 million ($258,000) and targeted commercial real estate for the first time as bubble risks spread in the world’s most expensive place to buy an apartment. This fails on two fronts. Wealthier people live in better locations. The locational value will be higher than those living in slums, so they will already be paying a higher nominal amount (land value x property tax percentage). The real issue is the holding time for real estate. Doubling the sales tax will only deter turnover (in order to cover the new higher sales tax). This will increase the holding time and thus amplify price movement. A yearly Land Tax is the preferred option. It is a holding tax – the longer a property is not earning rental income, the more pressure there is to sell it. A sales tax still allows property to be withheld from the market in order to manufacture scarcity and amplify easy profits. (Sheng) will repay about 4,000 yuan a month for the home, a one-hour subway ride from central Shanghai’s historic Bund that cost 16 times her annual salary, based on the apartment price and her income. The central government has since April 2010 moved to stamp out speculation in the property market by raising the down- payment requirement on first mortgages to 30 percent from 20 percent, ordering a minimum 60 percent deposit for second-home purchases and an increase in rates for second loans. It also imposed a property tax for the first time in Shanghai and Chongqing, and enacted restrictions in about 40 cities, such as capping the number of homes that can be bought. One imagines with the creative use of shelf companies and international borrowings, these hurdles can easily be overcome. Like gravity is to physics, applying cheap money to a fixed land mass is destined to increase land prices. 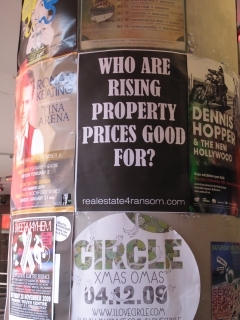 We ask, who are rising property prices good for?